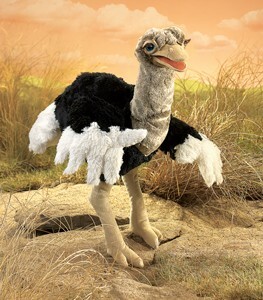 Folkmanis 3026 - The new Ostrich puppet is a rare bird indeed. A beautiful specimen with feathery soft plush and lustrous long eyelashes, this lovely long-legged creature holds its head up high when you insert your hand into the beak. Two handed wing movement allows for pecking, strutting and flapping fun! Measures 12" x 9" x 23".